Pondicherry means a lot of different things to people – beautiful French style street houses and cobbled stone roads just off the beach (that feature in every Tamil movie song and even in commercials now), Auroville (not been there yet, so won’t smart-mouth that), street shopping (my friend Priya tells me it’s worth driving down to Pondicherry for just that), cheaper car registrations.. But to Chennai men, it means just one thing – Booze heaven. Pondicherry is a union territory you see, so a lot of things are cheaper there – petrol, car registrations and booze being the most important ones. From Chennai, Pondicherry is a 3-hour car ride down the scenic and now traffic and accident prone East Coast road (ECR). I call ECR scenic by Chennai standards. You’ll get to see the beach as you drive along ECR and that’s scenic for us (Kaaka Kaaka movie, “Ennai konjam maatri” style. Open hair in a jeep wouldn’t work for us, common girls. So don’t try that). The area just off the beach is like a little French town. The restaurants are all named “Le Blah”, “La Duh” and they serve francized Indian food and authentic French or Italian food and they charge at euro rates. We ate at one of these restaurants going by the reviews on a popular restaurant portal and were terribly disappointed. There are antique stores and craft stores that also operate in the same vein. Behind this pretty French part of the town is a kind of canal, beyond which lies the Indian Pondicherry. Pondicherry is predominantly Tamil and most Tamil families in Pondicherry cook Tamil style food – Rice, Sambar, Idli, Dosai and the likes. My grandfather was from Pondicherry and “Pondicherry” is part of my father’s name. The Franco-Pondicherry food as Lourdes Tirouvanziam describes in her book “The Pondicherry Kitchen”, is very similar to Tamil food. I tried the Fish Assad from her book (recipe here) and it turned out great but it is remarkably similar to the Fish Kurma that we make. It’s creamy, delicately spiced and yummy with steamed rice. I’ve not come across restaurants that serve Franco Pondicherry food in Pondicherry (only fake-Indian food); but I’ll give it a try if I find one. 1. Scale and clean fish thoroughly. Pat dry and then rub in salt, chilli powder and turmeric powder. Shallow fry the fish in oil till halfway done. Remove on to a plate. Set aside. 2. Grind together the aniseed and cumin seeds together to a fine powder. Set aside. Soak cashew nuts and poppy seeds in 1 tbsp coconut milk for 10-15 minutes and then grind to a fine paste. Grind ginger and garlic to a paste. Set aside. 3. Add oil to a pan and heat. When hot, add cloves, cinnamon and bay leaf. Then throw in the onions and green chillies. Fry till the onions are nearly golden. Stir in the ginger garlic paste and fry for 1-2 minutes. Add the chopped tomatoes and cook till they turn soft. Add the second and third coconut milk extracts and bring to a boil. 4. Drop the fried fish and bring to a boil again. 5. Lower heat to low. Pour in the thick coconut milk and stir gently. Stir in the cashew-poppy seed paste and stir to mix. Simmer for 2-3 minutes for the flavours to blend. Switch off. Squeeze in the lemon juice, garnish with coriander leaves and serve hot with steamed rice. 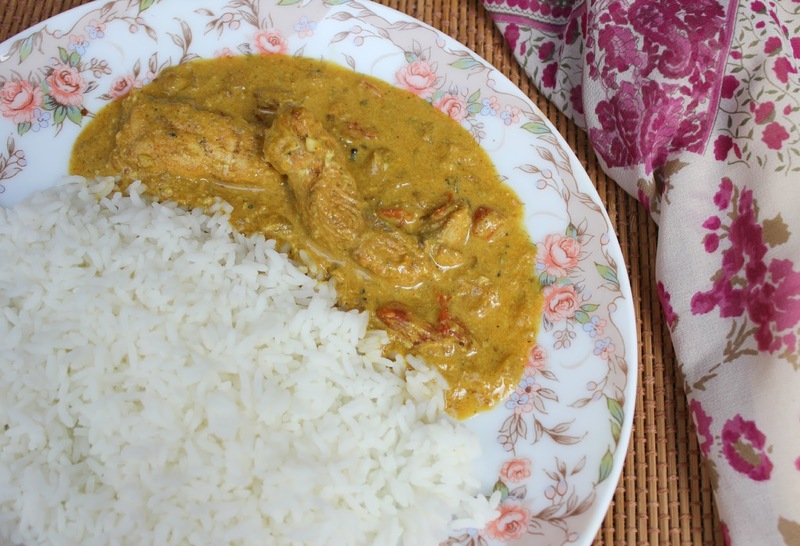 This entry was posted in Chicken, Fish & Meat, Dals, Kormas & Gravies and tagged Blogging Marathon, fish assad, fish curry, fish korma, fish kurma, fish stew, pondicherry cuisine, pondicherry food. looks interesting… masala is very good!! The gravy looks good, nice color. Very nice write up Jayanthi. Fish Assad looks so nice.. Funny post about Pondi.. Fish curry looks delicious. Jayanti I know about the booze part. Here too people flok for booze and cheap petrol. The assad looks yum. I cannot say about the cooking part but I will love to join you for a plate of assad and rice.